Rev Dr Marcus Braybrooke is my mentor and my elder in the interfaith field. I have followed in his footsteps in the interfaith movement. 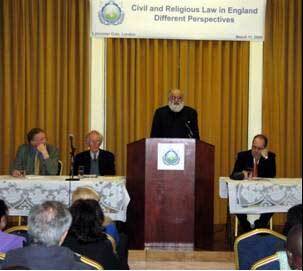 I have been involved in interfaith since 1973. It is a credit to the Universal Peace Federation for bringing us all on the same platform. This debate has been provoked by the Archbishop of Canterbury's speech on the 8th of March. He said that Shariah law is unavoidable and that is the most controversial point in the speech. Muslims are asking for this and the Archbishop of Canterbury was seen as becoming the spokesman for the Muslims in this country. He is advocating Shariah law which means chopping the hands and cutting off heads! Prime Minister Gordon Brown said 'No way!' Bishop Tom Butler, my interfaith adviser, said, 'Over my dead body!' When I read those articles and comments during the four days after the speech I thought they were almost going to crucify him. Some people said the Archbishop must resign! They said he has become a lunatic! He was heading for the sack if he had not have said what he said in the Synod. I was a magistrate for 26 years. We were trained in many places. In order to follow the interfaith world I gave up that work. I was a chairman of a family court so I have a little experience of this field of law. There are two types of law: civil and criminal law. The criminal law gives the power to punish people who have acted fraudulently etc. Only the State has that authority to punish someone in certain situations according to the penal code. I don't think our poor Archbishop thought by mentioning Shariah law he would be accused of trying to bring the penal code of Shariah law into the UK. Muslims are the second largest belief system in the world, Europe and the UK. There are fifty nine nations where Muslims are in the majority but only three nations practice some form of Shariah law, and even in those nations only partially. I am an orthodox Muslim. I am trained as an orthodox Muslim. I signed a document with Dr Tariq Ramadan. He was reviewing the penal code of exemptions of Shariah even until today. He believes it needs to checked before applying it in any nation in the world. He does not believe that the medieval penal code should be used anywhere in the world. There are 361 Jewish laws. There are a similar number of laws in Islam. We cannot commit adultery, or have a premarital sexual relationship. It is not allowed under Islam. For Muslims this religious law does need to be applied in Islamic terms but the law of the land is paramount. Let me discuss Shariah law. There are many misunderstandings regarding Islam. The word 'Fatwa' is very misunderstood. It is not killing or a death sentence. It is a legal opinion. 'Shariah' is similarly misunderstood. It is only the human interpretation of a sacred text. Islam is different from Muslim. It is the Koran. It is the proven interpretations of the Prophet. Muslims are the people who follow the Koran: the shadow of God on the earth. Islam is not hierarchical. The church and state clashes in the west did not occur in Islam. The church authorities could tax people in Western Europe. When the Prophet entered into Medina he created the Covenant of Medina. There were 52 clauses. All within the boundaries of Medina were equal under the law. The principle of the city state all living in Medina there was equality and mutuality under the law. If a Jew was involved in a dispute the Prophet would ask him under which law he would want to be judged. If he said Torah then he would be judged under the Torah. There was no question of religious law being applied on non-believers. The civil law must become of age to those issues that were mentioned by Marcus Braybrooke. Kosher and Halal all have practices that are against European law. They advocate killing animals without stunning but Jewish and Muslim communities are exempted from the law of the land in the UK. It is perfectly legal within the UK. There are many Islamic charities. We receive donations. These are monitored by the Charity Commission. The Charity Acts are applied equally in the UK irrespective of the faith. We have temples, Mosques etc under these charitable laws. The biggest breakthrough in Shariah law came in 2003 after the current Prime Minister and former Chancellor of the Exchequer realised that if the British financial law was changed it would allow more Islamic investors to invest in the UK. British law was changed to allow Shariah compliant investment in the UK. The Chancellor announced two years ago that this change to the banking system had facilitated £31million extra investment in the UK. No one said don't do it – you are bringing Shariah law! There are also chaplaincy laws, and food killing laws and other aspects already within UK law that are compliant with Islamic requirements. Forced marriage does not have anything to do with Islam. This is a misconception in the western world. It is a confusion of culture and religion. There are Islamic texts that allow such marriages to be made null and void. We have encouraged the Government to oppose forced marriages because it is not Islamic. Islam is a human interpretation of a sacred text. Shariah is a human interpretation of laws according to the Koran. There have been a huge variety of Shariah law interpretations. Shariah is not a fixed law. It is not one book. The Taliban was not recognised by Muslim nations, except three nations. They each had self-interested reasons for recognising Taliban. We do not eat smelly eggs. We do not have a theocracy. We rejected a law of Mullahs in the early days and promote one man one vote in the Prophet's time. Islam has never practiced theocracy and a genuine Islamic nation would never practice theocracy. There are different ways of democracy. The British democratic system has religious law and civil law mixed in the House of Lords. We have the best model in Europe of mixing these two within our democratic system. Islam has been demonised. Some of the reaction to the Archbishop of Canterbury's speech revealed a true picture of Islamophobia in our society. I wrote a paper in 1977 and I suggested to the Chancellor to save money by suggesting mediation among Muslim divorce cases. He accepted this immediately. Muslims have never asked for anything outside the law of the land. On these issues we need to be clear that Muslims did not ask for anything beyond the law of the land.